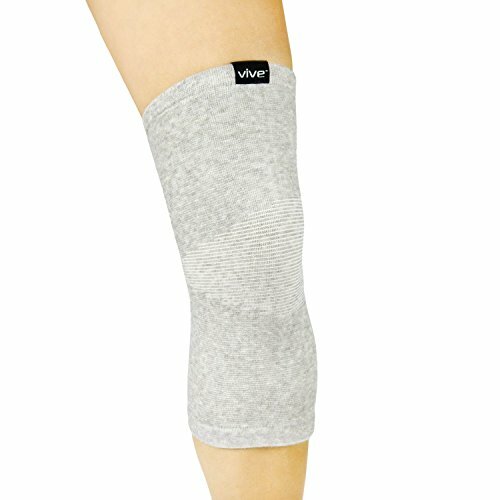 Soothing aching knees, the Vive bamboo knee supports provide gentle compression and support to increase circulation and reduce pain, stiffness and inflammation. A great support following knee surgery, the flexible knee sleeves also reduce pain associated with arthritis, tendonitis, sprains and strains. The latex-free knee supports are made with a unique bamboo-charcoal blend with antimicrobial properties to ensure the support sleeves remains clean and comfortable throughout the day. Providing gentle support and compression therapy, the Vive bamboo knee supports reduce pain and inflammation in the knees. Great for tendonitis, sprains and strains, each comfortably soft knee support is flexible, allowing for a full range of motion during any activity. Suitable for daily use, the lightweight, nonslip knee sleeves are perfect for general exercise, cross training, weightlifting and more. A unique bamboo blend supplies mild compression to increase circulation and promote healing warmth to relax muscles and soothe aching knees. The comfortable compression knee supports relieve arthritis pain and chronic fatigue. Also useful for post-surgery, the compression sleeves effectively reduce swelling and inflammation. Constructed with a soft bamboo-charcoal blend, the bamboo knee supports are temperature regulating, retaining therapeutic warmth when you are cold and releasing excess heat when you are not, so your knee stays comfortable and dry. The material also contains antimicrobial fibers to reduce bacterial buildup and unpleasant odors. Soft and latex-free, the blend is non-irritating to the skin for a comfortable fit throughout the day. PAIN RELIEVING SUPPORT: Providing gentle support and compression therapy, the Vive bamboo knee supports reduce pain and inflammation in the knees. Great for tendonitis, sprains and strains, each comfortably soft knee support is flexible, allowing for a full range of motion during any activity. Suitable for daily use, the lightweight, nonslip knee sleeves are perfect for general exercise, cross training, weightlifting and more. GENTLE COMPRESSION THERAPY: A unique bamboo blend supplies mild compression to increase circulation and promote healing warmth to relax muscles and soothe aching knees. The comfortable compression knee supports relieve arthritis pain and chronic fatigue. Also useful for post-surgery, the compression sleeves effectively reduce swelling and inflammation. BAMBOO CHARCOAL BLEND: Constructed with a soft bamboo-charcoal blend, the bamboo knee supports are temperature regulating, retaining therapeutic warmth when you are cold and releasing excess heat when you are not, so your knee stays comfortable and dry. The material also contains antimicrobial fibers to reduce bacterial buildup and unpleasant odors. Soft and latex-free, the blend is non-irritating to the skin for a comfortable fit throughout the day. DURABLE CONSTRUCTION: Made with a unique bamboo blend, the knee supports are exceptionally durable, withstanding frequent machine washing without pilling or fraying.